In the previous post, I discussed the rationale behind modeling a tripod as a torsion spring. Here, I am going to measure the stiffness (spring constant) and damping of a tripod and discuss in detail the methods and assumptions made. As a warning, math will be involved for complete clarity of the procedure. It is not necessary to understand all of the math to understand this article. A torsion spring is the rotational analog of a mass on a spring. Think of a ball glued to a slinky. If you drop the ball, and hold the other end of the slinky, it will oscillate up and down for awhile, before eventually coming to rest. For rotation, the equivalent of mass is moment of inertia The more inertia a system has, the harder the torsion spring will have to work and oscillations will thus be slower. The damping of the system will have to work harder too to absorb the greater energy of the oscillation, and they will thus last longer. The stiffness of the system is described by the spring constant . This is the primary factor that tripods are manufactured to minimize. A higher spring constant means that the tripod will deform less when subjected to external forces such wind, human hands, shutters, etc. The damping constant characterizes the rate at which vibrations that have been induced by said external forces will die out. In general, having low inertia, and high stiffness and damping will maximize the tripod performance. The inertia is supplied by you in the form of a camera, and the stiffness and damping are characteristic of the tripod. It is the latter two factors that we will be measuring. I am going to assume that we are in the underdamped limit, meaning that the damping constant is small compared to . This means that oscillation frequency will be very close to the natural oscillation frequency We will analyze the validity of this approximation later on. However, this approximation is going to help us greatly in actually taking measurements. My setup for making a torsion spring measurement on a tripod is as follows. 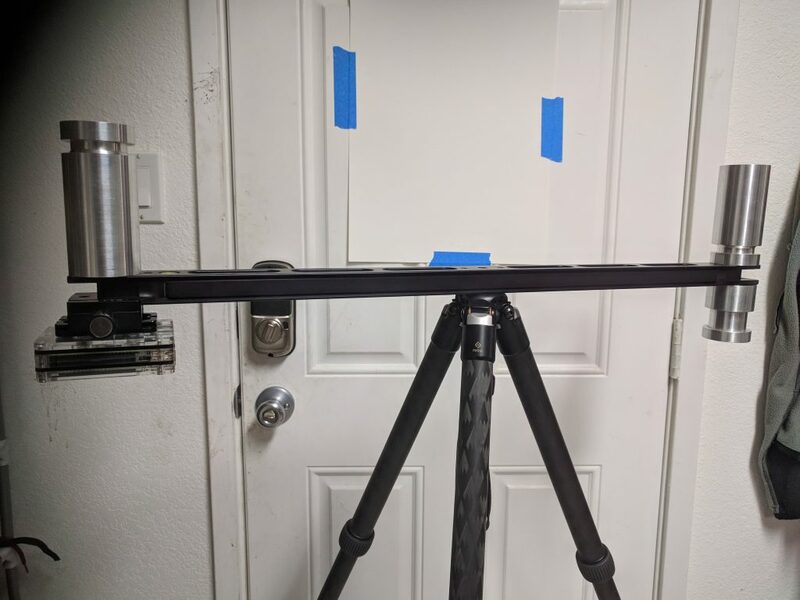 I have a Really Right Stuff 28″ camera bar supporting a three aluminum weights and a Raspberry Pi 3 on the ends of the bar. The Raspberry Pi has the Sensehat with an on board accelerometer. This measures vibration of the tripod. The aluminum weights on the ends of the bar add to the moment of inertia of the system, making the vibrations longer and slower for the purposes of measurement. A normal camera of course would have a much smaller moment of inertia, but by characterizing the stiffness and damping with this setup we can then calculate what kind of performance any camera would expect to achieve on this tripod. The test setup for measuring stiffness and damping. A bar with weights on the ends maximizes the moment of inertia, causing the tripod to vibrate slower and for longer. 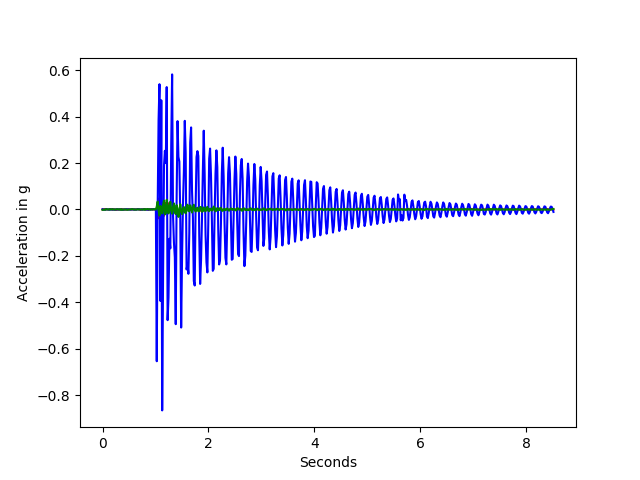 After giving the bar a gentle nudge to the side, I get data off the accelerometer as shown in the figure, with the moment of the push clearly visible. The moment during and immediately after the push are quite chaotic. However, the system quickly settles into an exponentially decaying oscillation, as we expect from the simple torsion spring model. The blue channel shows accelerometer readings for the side to side oscillations, or angular deflections about the top of the tripod. In green are the vertical vibrations, and barely visible in red are the accelerometer readings in the direction along the length of the camera bar. For now, I will only be focusing on the blue channel. Analysis of the other directions of motion will come in later posts. 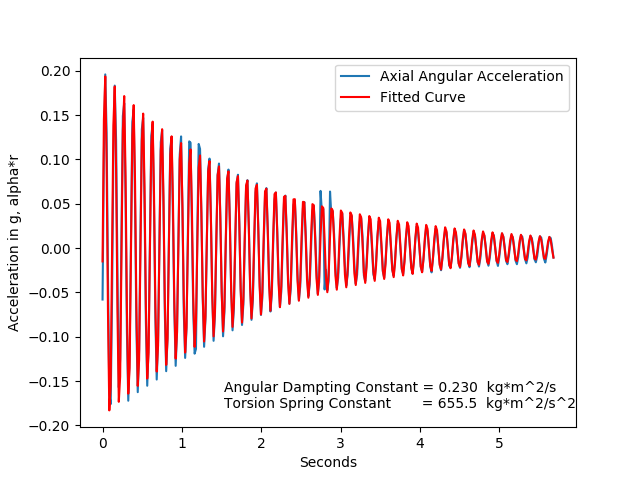 and the angular position data is simply proportional to our linear acceleration data. We can now simply fit the linear acceleration data series to and the constant of proportionality will get factored into the magnitude and phase constants , neither of which are relevant for determining the stiffness and damping. The following is graph is a fit of the data to the above exponentially decaying cosine along with the resulting values for the torsion spring constant and angular damping constant. This fit justifies the model of a tripod as a torsion spring system. It clearly fits very well to the data. The most uncertainty clearly lies in the exponential decay rate. Repeated trials were giving me angular damping constants of around 0.225 +/- 0.015. The measure of stiffness based on the frequency was much more consistent, with differences of less than 1% on repeated trials. The frequency of the oscillation in the above fit is 8.39 hz. The 1/e decay time was 2.04 seconds. The angular mass , was calculated to be 0.234 kg m^2 simply by measuring the masses involved. For further consideration, here is the Fourier transform of the entire set of acceleration data. This graph shows what frequencies are present in the data and it is consistent with the data in the fit. 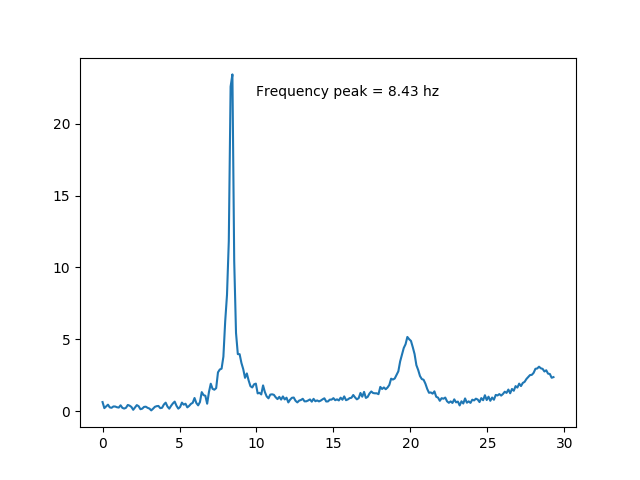 For those wondering why the reported frequencies are slightly different, it is most likely resulting from not fitting the frequency space peak to a Gaussian or some other distribution. I simply took the highest point and reported it. Clearly there is some other interesting structure visible in the frequency space, but the dominant dynamics occur in a very narrow range of frequencies, justifying the model. bit larger than the tripod, I think.